Our cycling tour leads you through three of the most beautiful countries in Europe: France, Germany and Luxembourg. This grand bike tour begins in the awe-inspiring city of Strasbourg, classified as a UNESCO World Heritage site. The lovely cycle path winds through the Zorn valley along the Rhine-Marne canal and its numerous locks. You arrive in the region of Saarland which offers plenty of sightseeing: the baroque city of Saarbrücken, the World Heritage Site “Völklinger Hütte”, the museum of ceramics Villeroy & Boch and the renowned river valley of Saar Bow in Mettlach. our biking adventure continues to the vast vineyards on both sides of the river Moselle until arriving at the Roman city of Trier. On the final day, you will discover magnificent varied landscapes of green forests and colourful fields. Luxembourg City, the capital of the only Grand Duchy in the world, will surprise you with its myriad delights. Arriving in Strasbourg, you’ll settle into your hotel and have the opportunity to explore the city on your own. Visit the cathedral of Strasbourg, stroll through one of the many museums or take a boat ride through the city. Today your bike trail leads you along the towpath of the Marne-Rhine canal to reach Saverne. 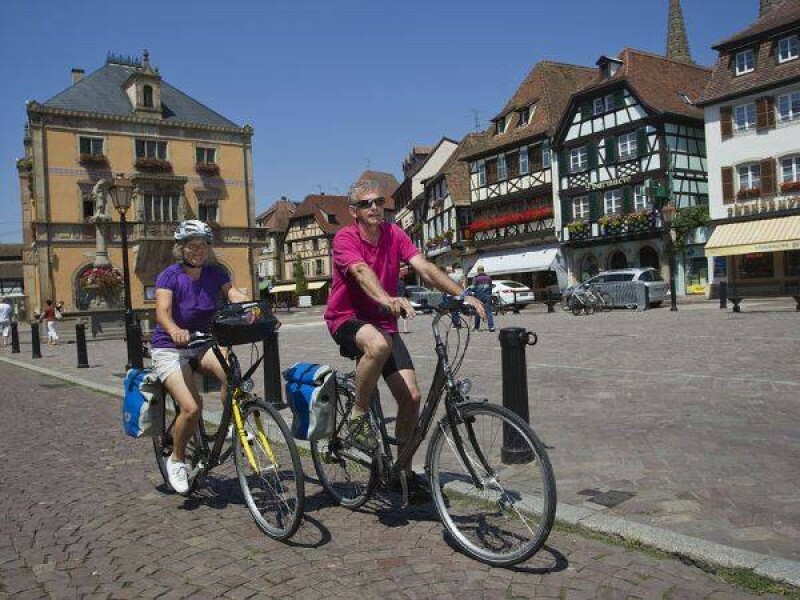 Many towns and villages surround the cycle path, such as Brumath, the capital of Alsace in Roman times and Hochfelden, famous for its fine brewing tradition. You’ll finally arrive at the picturesque town of Saverne with its impressive double lock on the canal. Cycle along the marina and enjoy a fantastic view of the Rohan Castle! You begin your tour with a transfer by bus to Mittersheim. 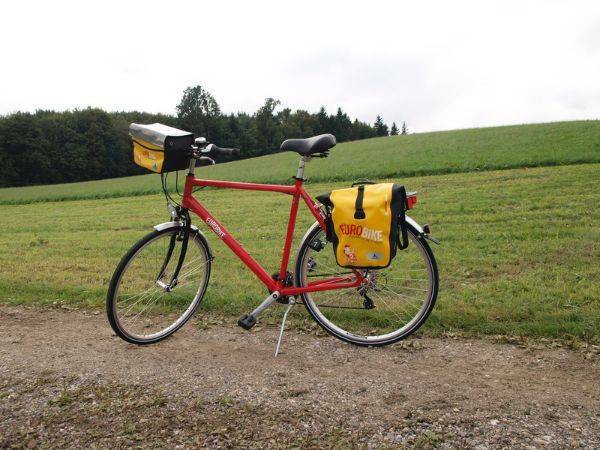 You will cycle along the Sarre Canal and discover beautiful forests and countryside landscapes. From Sarreguemines, famous for its earthenware, you reach Germany. Arriving in Saarbrücken, you enter a border city with French flair, a baroque cityscape and numerous sights and museums. You will follow the Saar cycling route which takes you to cultural highlights as the World Heritage Site of Völklinger Hütte (former ironworks). Covering an area of more than 600 meters, the gigantic foundry is the only fully preserved ironworks from the heyday of industrialisation in the world. Then you pass through the city of the Sun King, Saarlouis, before arriving in Merzig where you will be staying for two nights. 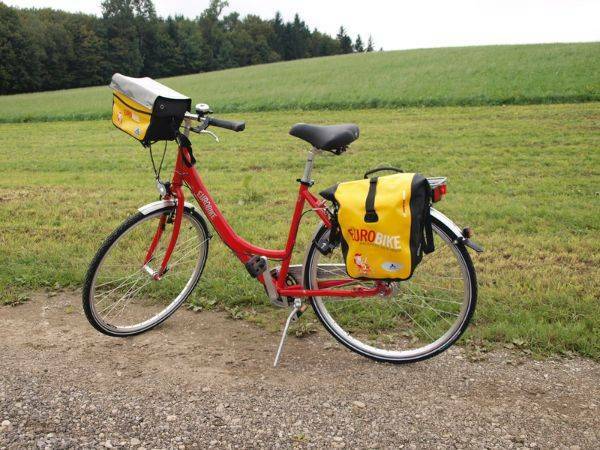 Take a relaxing break in the small town of Merzig or cycle in the heart of the Merziger Appelkischd, which means ‘apple box’, so named because of the many local apple orchards. On the way, you will see numerous apple trees, vast cornfields, rapeseed fields and maize fields. You will discover pieces of carved stone art that invite cyclists to an extraordinary day at the German-French border. After breakfast, you will be cycling a few kilometres to pass the Saar Bow, which is a unique natural wonder. From there you will cycle to Mettlach where you can visit the famous ceramics manufacturer, Villeroy & Boch. Behind the Baroque facade, you can experience more than 260 years of ceramic and corporate history. The route leads you to Saarburg, a picturesque town where you can admire a waterfall of 20 meters high. Continue to the vast vineyards right and left of the river Moselle until Trier. Take your time to visit the Porta Nigra, the amphitheatre, the Imperial Baths or the magnificent cathedral. 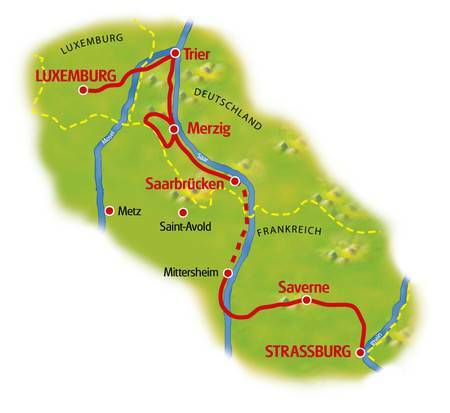 You begin this stage at the Römerbrücke and cycle again along the Moselle before you reach the border. Cycling on small country roads, through the little village and hilly landscapes with green forests, you arrive in Luxembourg, a modern and cosmopolitan city where you can visit the Ducal Palace, the Notre Dame Cathedral and the impressive Casemates du Bock, registered on the UNESCO world heritage list. Departure or extend your Luxembourg cycling holiday! You will ride mainly on cycle paths along the canals and waterways. The paths are mainly flat until arriving at Trier. Day 5 and 7 are a little bit hilly, on cycle paths, minor agricultural tarred roads or on little secondary roads without much traffic. 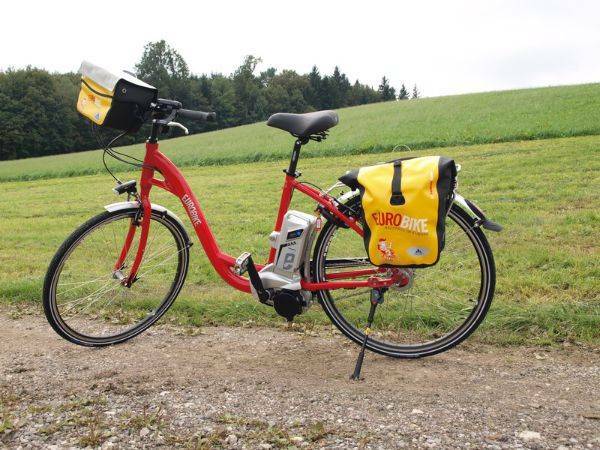 The Strasbourg to Luxembourg cycling holiday includes the daily transfer of luggage to the next hotel and local support if required.